This was my first time participating in the Instagram Me Made May challenge, where sewists share their daily handmade looks for all of May. Some of my handmade looks range from upcycled projects, t-shirt hacks, to made from scratch. As you can see through the various photos below, my style and sewing is all over the place. I probably would have a hard time being a "cohesive" designer. I can't seem to stick to a direct point of view and I'm fine with that. I sew and design based on what inspires me for that day, week, or month. I'm inspired by a variety of things from change of seasons, location, fabric, to my interests at the moment. For these #MMMAY projects I featured, I had a more "selfish sewing" approach. I focused more on enjoying the design and construction process rather than step aside every 2 minutes for photos. It also allowed for me to sew in the evening which is my favorite time to sew (kids are in bed and it's quiet). I typically sew for blog posts during the day because I need good lighting for photos. Below I posted my favorites and the Instagram posts about each piece. 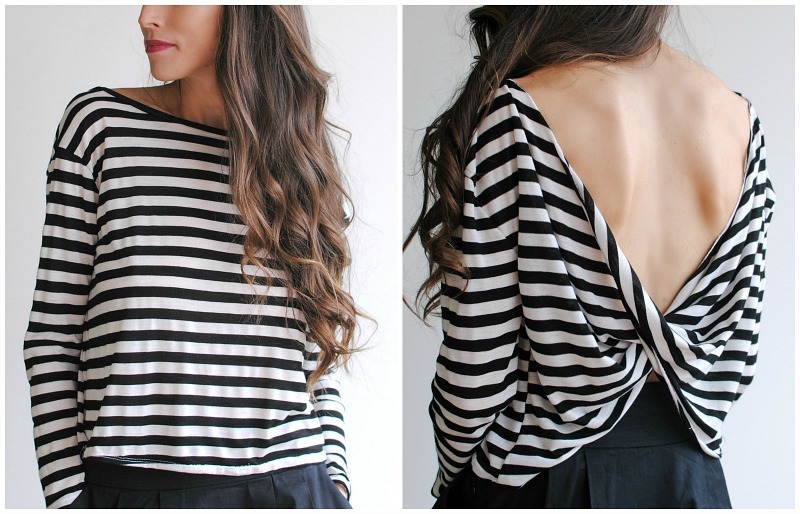 "This may look like a basic striped boatneck top but there is a party going on in the back. Plus who doesn’t love a classic stripe anyways." Tutorial for my twist top here, I added sleeves. Fabric from Stylish Fabric here. "My style can be all over the place and so is my sewing but I’d say I’m the most comfortable in sporty looks. Perhaps it’s that track athlete in me or that I’m a mom of 3 boys. This was an upcycled long sleeve from the husband that I’m embarrassed to say how long I held onto. I cut the bottom off and made a band hem for a modern fit. I did the same to the sleeves. I also took the side seams in a few inches. The party is all in the back though with an open cut out and center racerback." IG post shows before here. 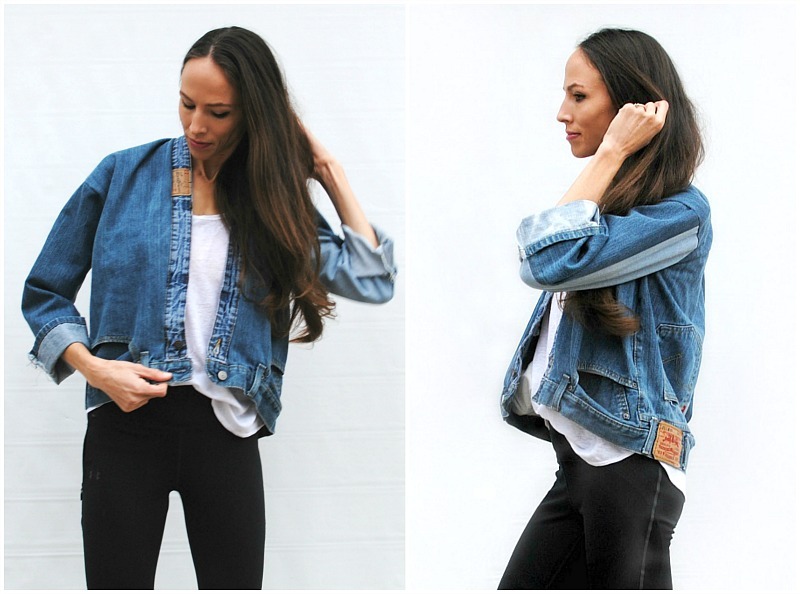 "Just update those ugly jeans into a rad denim jacket why don’t ya! Another unwanted item from my husband. I use to make denim vests like this in high school and sold them at my school. This time I wanted to see if it could be a cool denim jacket by adding sleeves. It's a loose kimono fit which I like. I used some scraps of denim I had to add to the center front as well. "My rise ‘n’ grind #mmmay18 look this am: Color blocking and zip details make this DIY track singlet one-of-a-kind." "Upcycle a t-shirt into this twisted back tunic/top." "A vintage pattern shift dress with knotted shoulder seams . . . When my Grandma passed away my Mom gave me her Sewing things including this vintage 60’s pattern. It was already cut out and folded neatly in the envelope. Who knows how long it has been but my mom said she was “making that dress for her when she was a teenager.” So I went ahead and finished it for the both of them using this retro floral print by Alison Glass. Would be a cute little gift for my mom don’t you think?" "Made this boho top from a crochet tapestry I got at a garage sale years ago for .25 cents. I remember buying a few pieces from this particular garage sale. They were selling items from an elderly woman who recently passed away. Her son told me she knit all of these crochet pieces in a basket. I of course bought them all! I like to think they're in good hands now. I finally decided on a design for it in this little boho top I can't wait to wear. I wouldn't dare cut into it so I made the top around the design and with a baste stitch just in case." 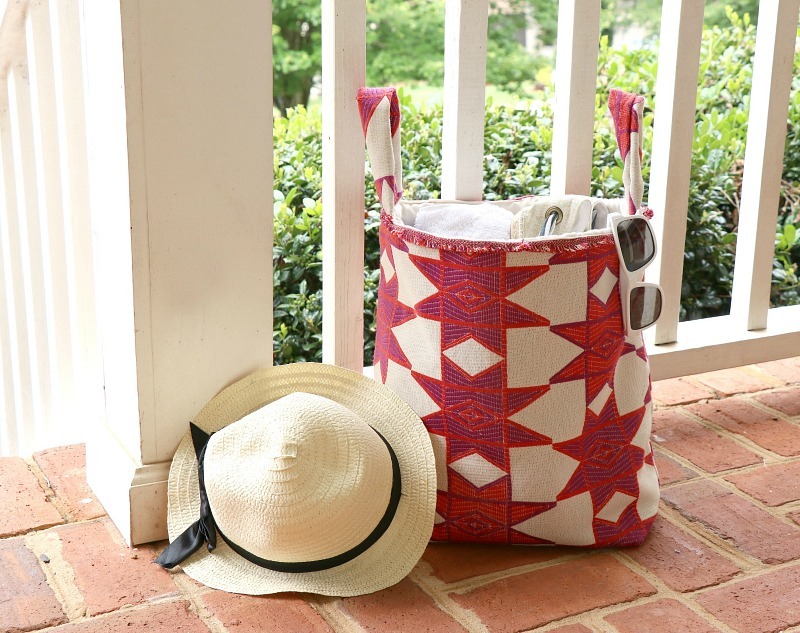 This fabric bin is versatile for storing my fabric but also the best beach/pool bag ever. Tutorial here. "My go-to casual look. I prefer t-shirts but with a twist like this handmade knit top and lace details. The ruched/wrap skirt is upcycled from a t-shirt. It's so comfortable, I wore it so much when I was pregnant." Tutorial here. This updated tank into a lace off-the-shoulder with my 5 minutes tutorial (in my Insta highlights) and my French toile shorts made ages ago here. 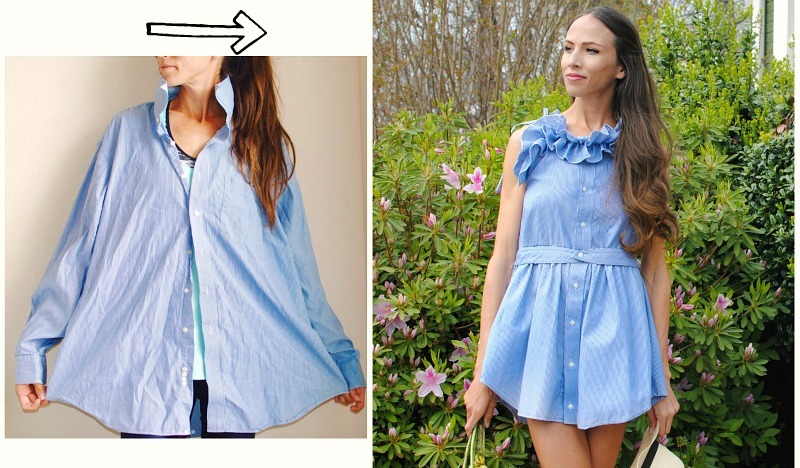 A cute little men's shirt refashion fit for this Southern Belle. Exclusive Fashion and the lady is really prefect for fashion world. Thanks for inspiring post. I am well aware of the importance of education in the imminent life as the whole world is facing limitless difficulties. Website fastessay is good for knowledge I saw some important topics in your well-prepared article. A problem can’t be solved without discussion and you have expressed major issues about education which are helpful for us. Get tutorial for how to hide taskbar windows 10 online. These are such a nice articles, I liked them very much. Thanks for sharing them with us. This will definitely going to help you in many aspects. You can do lot many things through these tips. You can check here too. Hey I am, a Law student in Deakin university. I am a satisfied follower of Sample Assignment. The law assignment help that they delivered was just flawless. I have also contacted their experts for marketing assignment that was delivered before the deadline. Their 100% plagiarism-free work and the professional team of experts is what makes them unique. Also, the way how they catered to my urgency level brings me back to them for more and more Online assignment help Australia.